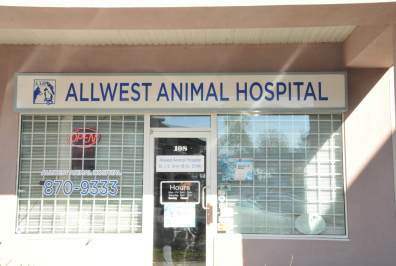 Allwest Animal Hospital is proud to serve Abbotsford, BC and surrounding areas. We are dedicated to providing the highest level of veterinary medicine along with friendly, compassionate service. If you have any questions about how we can care for your pet, please don’t hesitate to call us at (604) 870-9333. Thank you! We are proud to serve Abbotsford, BC and the surrounding areas. We are dedicated to providing the highest level of veterinary medicine along with friendly, compassionate service. At Allwest Animal Hospital, we offer a variety of services to care for your pet. If you have any questions or would like more information on how we can care for your pet, please contact us today. We welcome all new clients to our veterinary facility. We invite you to contact us today. If you have any questions or concerns, please don't hesitate to call us at (604) 870-9333. Thanks for the great peace of mind when I bring Hershey in . . . I know he is always getting the most technically advanced treatment that veterinary medicine has to offer! Thanks so much . . . I trust my best friend in your hands! Thanks so much for all that you have done for us! You guys are the best pet clinic in the area--really! Dr. Sran, thanks for making my life easy when it comes to bringing Luke in to the see you! Although, I think he may have a crush! I am convinced it's a crush . . . or those treats are doggone divine! But how could any four-legged creature resist? In all seriousness, thanks for providing Luke and me the finest. most complete pet care available . . . with a lot of love. I have seen a lot of vets in the past and your genuine love and care is truly rare. Thanks to the Drs and professional staff at Allwest Animal Hospital. I feel like you all truly love what you do! Every time I come in to see you, both me and my kitten have had such a pleasant experience. Everyone is so friendly and knowledgeable--I'm really impressed! Ever since I moved to Abbotsford you have made me feel so welcome to the area and to your family.